The commercial Dump Truck rear view camera Has a 120° Degree viewable angle, its waterproof and has auto night vision. The camera is one of the most durable we have, with incredible adjustability and night vision clarity. The RV Box camera has a metal sun shield visor to protect you from glare and pebbles. This camera can take a direct hit from a rock and it will still work like new, you can mount this anywhere on your dump truck but most mount it to the middle of the back towards the top of the truck. This backup camera is high range wireless as well so there will be no need to run a cable and can transmit 120FT. The transmitters are 100% waterproof and constructed of heavy duty materials so they will stand up to extreme weather and hard work environment. You can also have it battery operated so there are no cables at all. Finally, you can make it a two camera system if you need even more coverage. Though our wireless is supposed to work up to 120ft we have seen it work to 143ft in open space and the 120ft is if it supposed to go through heavy walls or metal. 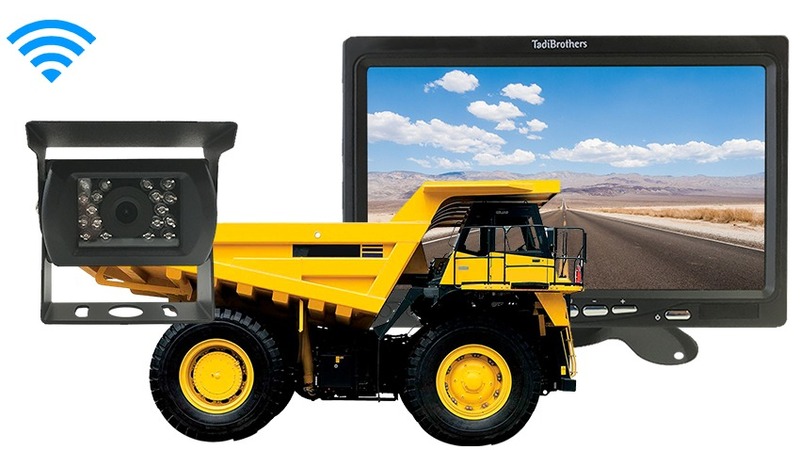 This wireless backup camera system for Dump Truck, like most of our vehicular products that have an LCD screen, can be used for video gaming, Considering that a perk or bonus for purchasing our back up system (others block that feature). At TadiBrothers we also offer an Extended Protection Plan. With the extended protection if anything goes wrong, including you damaging your system, we willreplace it with a brand new system at no cost. This protection covers anything and everything.